Proclamation of a tournament in the ages of chivalry. Home » Proclamation of a tournament in the ages of chivalry. IN all nations which have only reached a certain condition of society, the amusements of peace partake at least of the forms of war. The nations of antiquity, and the German tribes, like the savages of modern times, had their warlike games and ceremonies. In the ages of chivalry, these games took a more refined and more splendid form, under the name of Tournaments, and Justs, which appear from their names to have been first introduced in France. 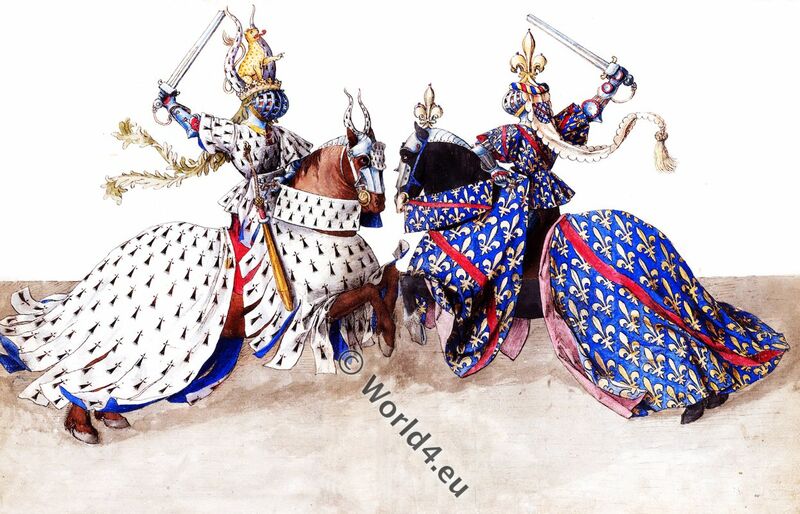 Military combats of this kind are said to have been practiced in France at the end of the ninth century, under Louis de Germanie * and his brother Charles, although they could hardly bear the name of tournaments till many years afterwards. * Louis II. The German (around 806-876) from the aristocracy of the Carolingians was employed by his father Louis the Pious as sub-king of Bavaria, which he ruled independently from 826 onwards. From 843 to 876 Ludwig was king of the East Franconia. The laws which regulated these combats were compiled a few years before the middle of the eleventh century. In spite of all the efforts of kings and churchmen to put a stop to them, tournaments continued to be popular till a very late period. 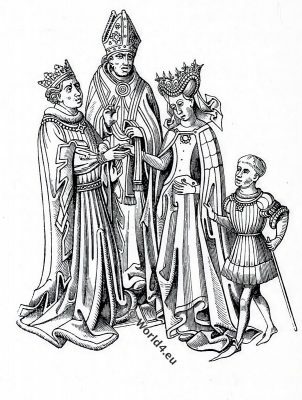 As early as the twelfth century, our kings made vigorous efforts to suppress them; for they were attended with numerous and serious disorders, were frequently the commencement of family feuds, which were not appeased till much blood had been shed, and served at times the purpose of seditious meetings at which the turbulent barons assembled to conspire against the king. Among the numerous treatises on the laws and customs of tournaments, no one is more interesting than the Traité des tournois of René I. d’Anjou. This prince was born in 1408, and became duke of Anjou in 1434. Jeanne II. queen of Naples, declared him her heir in 1435, but he was driven from his new kingdom by Alfonso I. King of Aragon, who had previously been adopted by the same queen. After several fruitless attempts to recover this inheritance, René renounced his claims to the crown of Naples in 1473, and retired to his own hereditary dominions, where he was beloved by his subjects. He died at Aix in Provence, in 1480. The Dukes of Bourbon and Brittany in duel during a tournament. 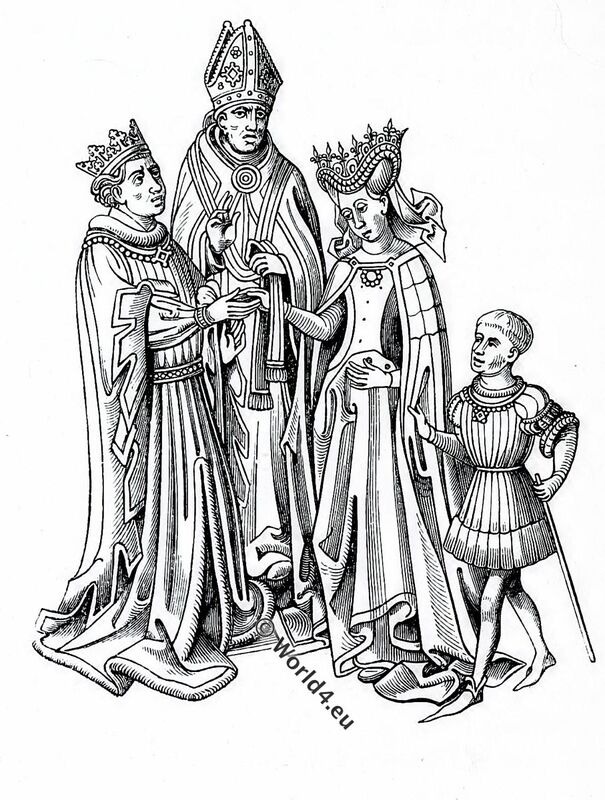 Illustration from the Tournament Book by King René d’Anjou (Livre des tournois). France, Provence 15th century. Miniature from circa 1488 after Barthélemy d’Eyck. René was distinguished among his subjects by the title of The Good. He was a great patron of chivalry, as well as of literature and the fine arts, in all which he himself excelled. His court was frequently gratified with splendid tournaments, and he is supposed to have composed his famous Traité about the year 1450. Several manuscripts of this work are preserved; but the one from which our plate is taken, and which is now in the Bibliothèque du Roi at Paris (ancien fonds, No. 8352), was René’s own copy, and it is said that the illuminations were drawn by his own hand. The drawings are interesting not only as vivid pictures of the manners of the time, but as valuable specimens of heraldic costume. A very splendid edition of this work, with accurate facsimiles of the illuminations, was published at Paris in 1826, in a large folio volume. The celebration of a tournament was preceded and accompanied by many acts and ceremonies, which were exactly denned and determined by a regular code of laws. 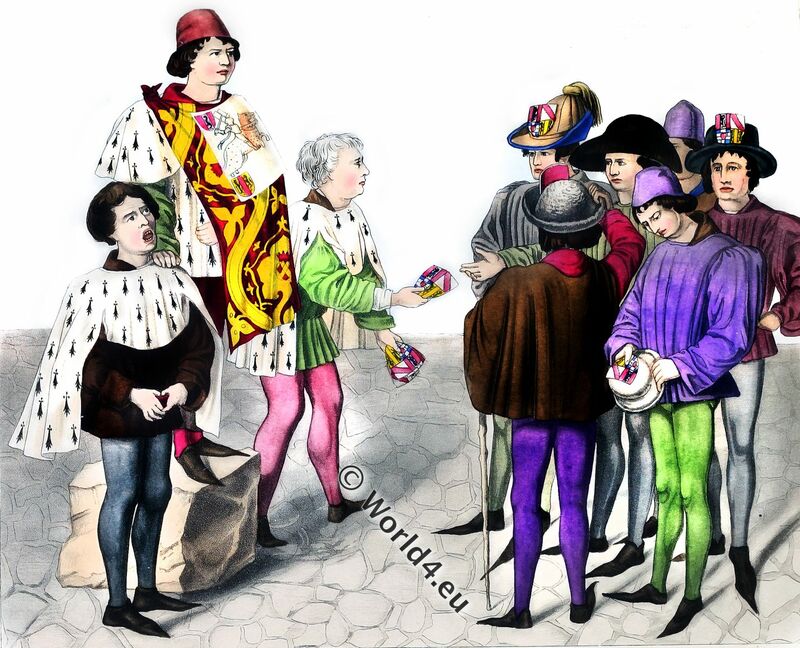 It was announced long before the time appointed for its celebration, in a ceremonious manner, in all the civilized states in the west of Europe, in order that all knights who stood high in chivalric fame, might have the opportunity of attending. In King Rene’s book these forms and ceremonies are not only declared in writing, but they are represented to the eye by a series of spirited illustrations, of a tournament between the duke of Bourbon and the duke of Brittany. Our plate represents the fifth in order of this series of drawings. 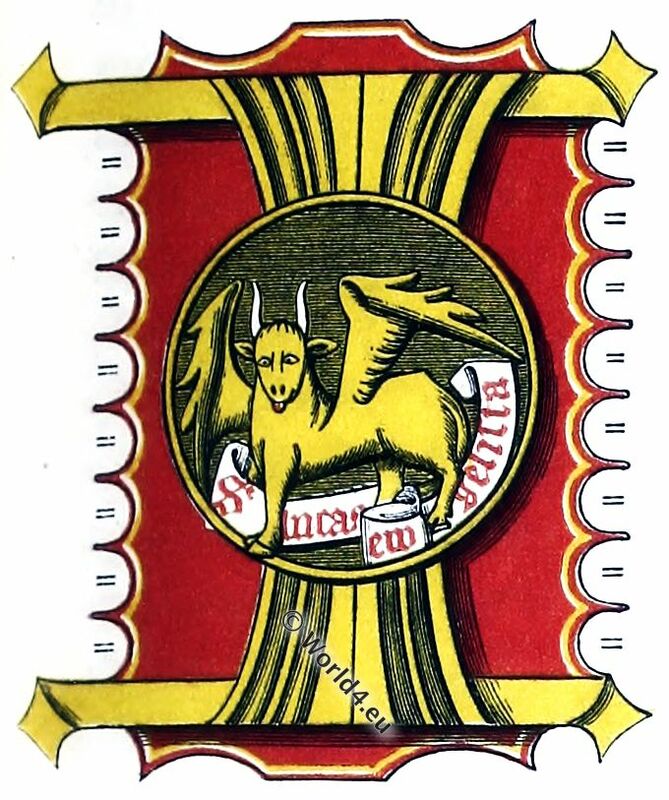 The person standing on a block between the two poursuivants, is the King of Arms of the Duke of Brittany. On the present occasion he has added to his ordinary costume two yards of gold cloth or velvet, in the manner of a small mantle, with a parchment attached, on which are figured the two combatants ready for the fight. 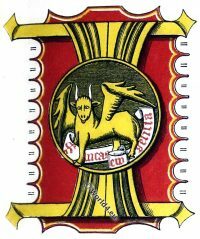 His two poursuivants, covered with the ermine of Bretany, are employed in proclaiming the Tournament and in distributing to those knights and esquires who intend to take a part in the tournament, the shields of arms of the four juges-diseurs, or umpires of the field. The cut below, representing a Royal Marriage, is taken from a splendidly illuminated manuscript life of St. Catherine, executed in the fifteenth century, which formerly belonged to the library of the dukes of Burgundy, and is now in the Roval Library at Paris. Source: Dresses and Decorations of the Middle Ages by Henry Shaw F.S.A. London William Pickering 1843. Fashion and costumes from Ancient times until 19th century. Collection. The Corset and the Crinolin fashion history. Collection. 15th century medieval room interior. The history of Tobit. Historia Scholastica. Gabrielle d’Estrées, mistress of the French King Henry IV. 16th century, Renaissance. Henri de Lorraine, duc de Guise. France 16th century. Huguenot wars. This entry was posted in 1450, 15th Century, France, Middle Ages, Nobility and tagged Burgundian fashion period, Henry Shaw, Knighthood, Medieval costume on 3/20/17 by world4.